VAN NUYS, CA – Starting the first part of next month, the California News Press will have its own adventure and travel writer reporting live from Antarctica. The local community newspaper has a team of travel writers that have circled the globe many times, but this trip to the final continent is the first of it’s kind for the staff that make up the travel section. “We are thrilled to partner with Poseidon Adventures, and have the opportunity to bring original travel content about Antarctica to our readers in Southern California. Our travel writer Joann Deutch has traversed the world writing about it, from the Galapagos Islands to Denmark, and everywhere in-between. But this adventure to Antarctica is going to be the crown jewel in her writings. I look forward to publishing her correspondence from the ends of the earth,” said Newspaper Editor George Christopher Thomas. There are many reasons why adventurers of all types travel to Antarctica. Most of us are inspired by the opportunity to experience unique wildlife—penguins, seals, whales—going about their lives in a pristine, natural setting far from civilization. Set against a backdrop of ethereal icescapes, towering mountains and calving glaciers, these species beckon visitors to the northward-jutting Antarctic Peninsula and its adjacent islands – “ground zero” for Poseidon’s Antarctic expeditions. Other travelers come to see this frozen land as the giant laboratory it’s become, where science and international cooperation have created a “natural reserve, devoted to peace and science,” according to the Antarctic Treaty System that governs the continent. Changes in the global climate play out here in dramatic fashion, and an Antarctic tour provides a unique opportunity to learn first-hand the dynamics at work, and how they are affecting indigenous species and the complex food chain they depend on. Firsthand discovery with naturalists and historians — On board Poseidon’s Antarctic expedition vessels, our international English-speaking staff provides a welcome, unpretentious environment, leaving you to set your own pace. Naturalists, historians and other experts—veterans of many Antarctic trips—will engage and entertain you by providing informal lectures and inviting your questions. Using our fleet of rugged Zodiac landing craft, they’ll guide you ashore to secluded coves where colonies of Gentoo, Chinstrap and Adelie penguin often dominate the landscape. Photograph whales, hear the bellows of unruly seals and the calls of seabirds overhead. Our aim is to provide you with an incredible wilderness experience, yet one that puts safety and environmental stewardship first and foremost. 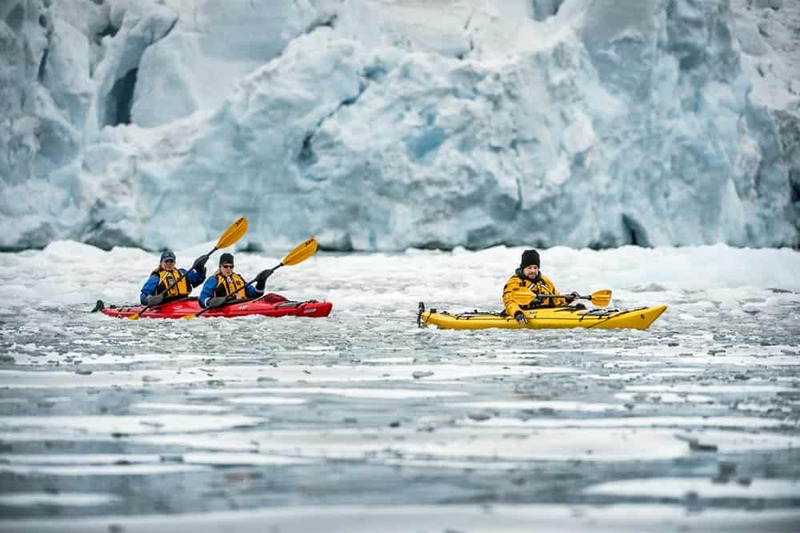 Our Classic Antarctic and Holiday programs — On these 12 day/11 night Antarctic trips, you’ll embark/disembark in Ushuaia, Argentina, cross the Drake Passage and spend five days exploring the Antarctic Peninsula and the South Shetland Islands. These expedition cruises are planned for the height of the Austral summer, when waterways are open to navigation and wildlife is at its most active. Numerous Zodiac landings are scheduled, but are determined by weather conditions and our experienced captain and expedition team. Polar Circle program — Scheduled for February 2018, this 13 day/12 night Antarctica cruise provides an extra day of exploring the Antarctic Peninsula, and takes you south of 66? 33’ 44”, the latitude of the Antarctic Circle. This puts you among a very elite group of adventurers ever to travel this far south. Antarctic cruises including South Georgia and the Falklands/Malvinas Islands programs — These expedition cruises—ranging from 20 to 23 days in duration—include not only the best of the Antarctic Peninsula and South Shetland Islands, but also visits to other storied Southern Ocean destinations. Isolated at the edge of the submarine Scotian Ridge, South Georgia is covered with jagged, glaciated peaks, and is home to a colony of more than 100,000 breeding pairs of King penguins. View whaling artifacts at the small settlement of Grytviken and walk to the nearby museum and cemetery where Sir Earnest Shackleton, the great English explorer, is buried.